Not all abstract games have to be boring or tedious (we have to admit that many aren't). 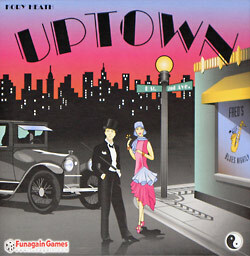 'Uptown' by Kory Heath is a shining example here, as it combines elegance of rules with a good gameplay, depth and a friendly (short) game length. W. Eric Martin from 'boardgamenews.com' originally introduced us to this game during his visit in Munich, and it was a quick hit with the group back then. Now the German version is out, and there is a reason to crown this game our 'GAME OF THE MONTH'. As a quick tile-laying game with satisfying decisions and high fun-factor it is definitely recommended!